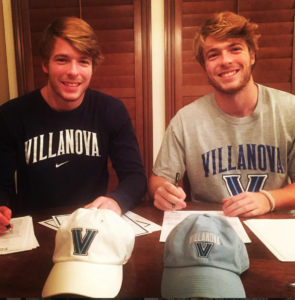 This month, Alex and Thad signed their National Letters of Intent to play lacrosse at Villanova University. They signed on it on the first day that they were allowed, and then their high school (Oak Hall) held a signing ceremony for the six players in the class of 2018 who have committed to play college lacrosse. While we’ve known this was the path for a while (the boys committed to Nova two years ago), it was nice to see it all come together. Liz and I are incredibly proud of their athletic and academic achievement, as well as their hard work, commitment, leadership, humility, and sportsmanship. We look forward to their last season playing at Oak Hall and then what awaits after that. We’re thrilled that Villanova is both a top academic institution and a traditionally top-20 lacrosse program; it’s also pretty cool that they’ll be back in the part of the country where Liz and I grew up. My Facebook post.Gainesville Sun story by Larry Savage. Press release from Oak Hall Lacrosse Twitter. Congrats, boys. We’re proud of you.